An ailing bighorn sheep caught and killed by wildlife officials in Hemenway Park three weeks ago has tested positive for viral pneumonia, but it does not appear to be a particularly lethal strain. Still, officials are dismayed by the presence of the virus, which could cause lambs to get sick and die for years to come in one of the state’s most robust and important herds. “You don’t have to have dead sheep littering the landscape to have your worst fears confirmed,” said state wildlife veterinarian Peregrine Wolff. Officials hope to get a better sense of the herd’s overall condition when they count sheep from the air using a helicopter late this month and early next month. Wolff predicts the annual survey will show a lower than expected number of young animals as a result of the pneumonia outbreak, which still appears to be in its early stages. About 10 sheep have turned up dead in the River Mountains between Henderson and Lake Mead so far this summer. Most of the carcasses were found at the northern end of the range. Several of the dead animals tested positive for a type of bacteria associated with pneumonia, but that wasn’t enough to prove an outbreak of the deadly illness in the herd. 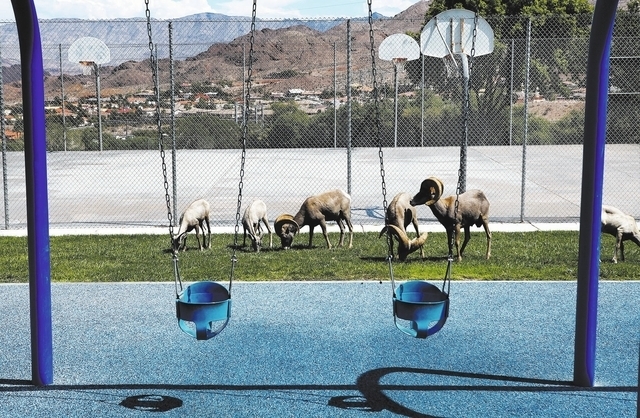 On Sept. 5, wildlife officials staked out Hemenway Park in Boulder City, where they picked out a sick-looking ewe born within the past year from a group of about 60 animals. The ewe was caught and euthanized so its tissues could be tested. Wolff said the animal “may not have died the next day” from pneumonia, but the infection was widespread and probably terminal. “She just looked out of it. It was obvious she did not feel good,” she said. Now that pneumonia has been confirmed in the herd of about 220 sheep, wildlife managers will no longer be able to use animals from the River Mountains to repopulate mountain ranges across Nevada and other Western states. “For the time being, that is off,” Wolff said. Since 1967, state wildlife officials have restored sheep to more than 60 mountain ranges across Nevada and helped boost their total population to more than 11,000 adults, more than any other state. The River Mountains herd has served as the main supplier for that program. Of the nearly 2,900 sheep captured and relocated over the past 45 years, more than 800 came from that range. Bighorn sheep have no natural resistance to pneumonia and tend to die at a high rate. Those that survive become carriers, infecting and eventually killing newborn lambs in a cycle that can diminish a herd for up to a decade, if not wipe it out altogether. A more serious pneumonia outbreak is now playing out at Mojave National Preserve in California, 100 miles southwest of Las Vegas, where two herds are afflicted and half the animals in one of the herds have already died. Contact reporter Henry Brean at hbrean@reviewjournal.com or 702-383-0350. This story first appeared in the Las Vegas Review-Journal on Sept. 19.